Star Wars is a classic and a favorite of kids and adults alike. 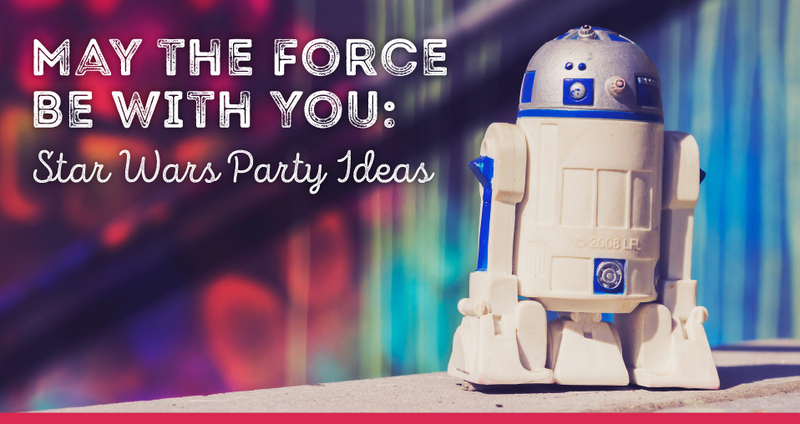 Fortunately, you don’t have to travel to a galaxy far, far away to find Star Wars party ideas. And with Star Wars Day quickly approaching, you have the perfect reason to turn those ideas into the event of the year, at least within your circle of Star Wars loving friends. Check out our ideas for decorations, snacks, games and favors perfect for the Star Wars party theme. The exact origins are a little hazy, but the rise of the internet made it much easier for fans to claim the day as their own and join together to celebrate. It’s a yearly tradition and the perfect time to let your Star Wars fan flag fly. No Star Wars party is complete without themed decorations to set the stage. You’ll likely find options at local party supply stores, but crafting your own simple decorations makes your party special. Even a few decorations create the feeling of the movie. Space backgrounds behind tables or key party staging areas are easy to create with inexpensive black plastic tablecloths or large sheets of black paper. Splatter white paint on the black background to create stars. That’s all. Tape it to the wall, and you’re ready to add other decorations. Every Star Wars party needs a Death Star as part of the décor. Create your own with a large paper lantern and some spray paint. Cut out little pieces of cardboard to create the detailing, along with a small cardboard circle to make it look more like the real Death Star. Spray paint the piece gray, and add any final detailing. Start with an inflated balloon in the middle. Cut out two wing shapes from cardstock. Twist two pipe cleaners together to make a longer piece. Wrap it around the balloon widthwise, twisting it to keep it in place. Twist the ends together to form one piece. Repeat with two more pipe cleaners, this time twisting the pipe cleaners on the opposite side. Attach a wing to each of the two extended pipe cleaner sections. Hang the Tie Fighters from the ceiling. Plan for cleanup with a decorative touch using a small white trash can with a rounded lid. The shape is the perfect base for an R2D2 replica. Cut the details from vinyl, paper or colored tape, and stick them to the trash can. With all of the excitement of the day and the fun activities on the agenda, your guests need plenty of Star Wars snacks and desserts to refuel. Many party foods get a Star Wars makeover with simple changes to the presentation. Another way to incorporate the theme is by using a little word play in the name. Create labels with black starry backgrounds and yellow font like the iconic Star Wars lettering to display those creative names. Finger foods always go over well, whether you serve them before or during the main course. If you plan an afternoon party, you can get away with just serving snacks and a dessert. Grape lightsabers: Slide grapes onto a skewer to create healthy lightsabers. Strawberries, raspberries, blueberries and blackberries also work. A large marshmallow at one end works as a sweet handle. Pretzel lightsabers: Another edible lightsaber idea starts with long, thick pretzel rods. Dip them in colored melted chocolate, leaving about an inch at the end as the handle. 7 Leia dip: Whip up a batch of 7 layer dip, and call it 7 Leia Dip to bring in the Star Wars theme. Vader veggies: The traditional veggie tray gets a Star Wars makeover simply by calling it a Vader veggie tray. Add some droid dip to round out the tray. Tie Fighters: Make edible Tie Fighters with cheese crackers and cheese cubes. Use cream cheese or cheese spread as the “glue” to hold a small cheese cube between two cheese crackers. If you prefer a sweet version, use a marshmallow between two graham crackers with cream cheese or Nutella to hold it together. Yodamole: Spread out guacamole on a serving platter in the shape of Yoda’s head. The green color of guacamole is the perfect shade to represent Yoda. Add sour cream eyes with black olives in the center. Serve a side of scoop-shaped tortilla chips, and call them Trooper Scoopers. If you’re planning a full meal, you can still incorporate the Star Wars theme into the food. It just takes a little creativity. One option is Bow-ba Fett pasta. Cook up a large pot full of bow tie pasta to create the dish. Add your favorite sauce and other recipe add-ins to create the dish. A similar option is Boba Fettuccine Alfredo. A sign with a Star Wars font to display the play on words adds the perfect finishing touch to the dish. Another option is Death Star pizza. The pizza is already the perfect shape — we even have the perfect pizza pan to match. Add toppings to make the pizza look like the Death Star, bake and serve. Another easy option is to create BB-8 pizzas. Place a smaller half circle at the top of your regular pizza to create BB-8’s shape. For a simple dish, serve ham sandwiches. Add a Ham Solo sandwiches label to create the tie-in to the party theme. A similar idea is to serve Han Burgers and Hoth Dogs. For these options, you don’t have to do anything special with the hamburgers or hot dogs. Just add the sign with the Star Wars name to make the connection. It’s customary to end a party with a sweet treat. Lucky for your party guests, there are plenty of easy Star Wars cake ideas and other desserts perfect for the occasion. One simple option is to make a lightsaber out of cupcakes. Decorate three cupcakes with gray frosting and the rest with frosting in blue, green or another lightsaber color. Line them up in a long row, with the gray cupcakes at one end. Candy-coated chocolates work well for making the buttons and details on the handles. You can also create the same idea with a sheet cake. Cut the cake into long strips all the same width. Place them end-to-end, and cover them with frosting. Start with a basic round cake. You can even buy one at the bakery if you don’t want to bake. For a Hoth design, cover the cake with white frosting. It doesn’t have to be perfectly smooth. Think of the ridges as snow drifts. If you prefer a Tatooine design, frost the cake and cover it in crushed graham crackers to look like sand. Pop a few Star Wars Lego figures on top to finish off the cake. With all the tasty food you create, you guests need silverware to enjoy it. Here’s another chance to add a themed touch. Pick up solid-colored napkins to create the look of lightsabers. Cut strips of paper about 2 inches high, and decorate them to look like lightsaber handles. Line up the silverware along a straight edge and roll straight across. This creates a long, smooth, lightsaber-like look. Wrap one of the paper handles along the bottom end, and tape the paper in place to hold the napkins on the silverware. Colorful serving bowls are perfect for the Star Wars theme. Have different sizes on hand to best fit the snacks and foods you serve. You’ll also want plenty of serving utensils ready to keep hands out of the food. And, of course, you’ll want food storage containers on hand for safe storage of all the leftovers. For a creative way to serve beverages, turn a drink dispenser into R2D2. Place a rounded bowl on top of the container to create the shape of the character’s head. Use paper or tape to cut out all of the details, and attach them to the bowl and the drink dispenser. Games and activities based on Star Wars keep your guests entertained during the party. The activities you choose depend largely on who shows up at the party. If you’re throwing a party for kids, the activities should be things they can handle and enjoy without getting frustrated or bored. For an adult-only Star Wars party, choose activities more appropriate for an older audience. Star Wars costume parade: Anyone excited to attend a Star Wars party will be just as excited to show up in costume. Make it clear on the invitations that all guests are encouraged to dress as their favorite characters from the movie. On party day, set up a runway where guests take turns showing off their costumes. Award prizes for the best costumes. Jedi training: This is another activity that works for both kids and adults who are die-hard fans of the franchise. Set up various training activities for the future Jedis to practice their skills. Use pool noodles to make lightsabers for mock lightsaber battles and set up an obstacle course. Photo booth: Another way to get mileage out of the Star Wars costumes your guests wear is by setting up a photo booth. Create a space-like background with Star Wars written at the top. Guests can pose together, or you can provide props if guests don’t wear costumes. Movie screening: You’re having a party to celebrate Star Wars, so it makes sense to show at least one of the movies. Gather in the living room or set up an outdoor projector for a drive-in feel. Use large cardboard boxes decorated like landspeeders as a fun place for the kids to sit and watch the movie. Death Star toss: Paint an image of the Death Star on a large cardboard box. Cut out the smaller circle on the Death Star. Players toss beanbags toward the hole to score points. Free Han Solo: Let the party guests save the day by freeing Han Solo from the carbonite. Freeze a Han Solo action figure in water. The players have to melt the ice to free him. To add a competitive element, freeze multiple Han figures, and divide the party guests into groups. The first group to free Han wins. Star Wars trivia: Guests at a Star Wars party likely know a thing or two about the movies. Create a trivia game to see just how much they know. Choose questions of varying difficulty levels. Assign points based on difficulty. Build a droid: Gather lots of Legos for this activity. Each participant builds a droid using the pieces. Show off the creations at the end of the building time. Send your guests off with fun party favors to remember the party. You can find all sorts of Star Wars-themed books, toys and other items that work, or you can get creative with party favors. Bubble wand lightsabers: If your guest list includes kids, bubble wand lightsabers are perfect as party favors. Head to the outdoor toy area of your favorite store to find the long, transparent, colored tubes of bubbles. You’ll know them when you see them — they look a lot like lightsabers on their own. Back at home, spray paint the handles silver, and add your own detailing to make them look like lightsaber handles. Glow stick lightsabers: For a smaller version, make lightsaber party favors from glow sticks. Wrap duct tape around the bottom portion to create a handle. Jedi certificate: Create a Jedi Knight training certificate for each party guest. It’s a fun way to commemorate the party that guests can frame afterward. Pez dispensers: Young and old alike enjoy popping candies out of Pez dispensers, and Star Wars characters are popular options in the candy dispensers. Pop a character with some extra packages of candies in a cellophane bag to hand out as guests leave. Photo booth photos: If you’re setting up a Star Wars photo booth at the party, snap a picture of every guest at the beginning of the party. Print a copy on your home printer. Send each guest home with a fun photo. Add in a photo frame, or slip the photo inside a Star Wars-themed thank you card to round out the photo gift. Coloring book lightsaber: For the kids at the party, a coloring book lightsaber is a fun party favor idea. Roll Star Wars coloring books as tightly as possible, and secure with painter’s tape. The tape comes off cleanly without tearing the book. Wrap the coloring book with construction paper. Add a strip of gray construction paper at the bottom edge to create a handle. Star Wars Day will be here soon. Have you planned your party yet? Ceramcor has you covered for all of your party cookware and bakeware needs, so grab your Han Solo or Princess Leia costume, and start celebrating.